Masaki Kobayashi served as a rebel filmmaker in Japan’s thriving, defiant postwar cinema, presenting his most vital criticisms of authoritarian powers through jidai-geki, or period pieces, which veiled the director’s censures of contemporary officialdom behind their historical setting. Harakiri stands as Kobayashi’s most pronounced anti-establishment film, its raw moments of symbolic violence balanced with a narrative whose allusions hold tragic humanist and social implications. Condemning his country’s lingering ties to their feudal past, his tale of desperate samurai and corrupt feudal clans challenged its Japanese audience to look into their history for a modern precedent, and represents, with unparallel clarity of purpose in his career, Kobayashi’s need to defy authority. Kobayashi’s rebellious character began at an early age. He admitted to historian Linda Hoaglund, “All of my pictures are concerned with resisting entrenched power. I suppose I have always challenged authority.” After graduating from Tokyo’s Waseda University, where he studied art history, Kobayashi became an assistant director for the Shochiku Ofuna film studio in 1941. Shortly thereafter, he found himself drafted into the Japanese Imperial Army, where, being a pacifist, he refused promotion into the elitist command class. Though he could not protest the war openly, rejecting an officer’s position placed him alongside grunt soldiers and saved him from joining the hierarchical circle of military leaders who caused the Pacific War, which Kobayashi believed a senseless conflict. Surviving the war, he returned to filmmaking and began directing his own pictures in the 1950s. Even in his earliest work, such as The Thick-Walled Room from 1953, Kobayashi’s rebel persona could not be denied. The film, based on the diaries of war criminals, was censored by the studio until audiences were “ready” for outright subversive sentiments. Over the next several years, Kobayashi’s films would tell stories about individuals standing up against hypocrisies, despots, and crooked administrations. Kobayashi’s radical characters protested injustices, and when they hit the bureaucratic wall, sharp outbursts of violence became their only means of expression, however futile. In other words, Kobayashi’s characters resolve to die for their ideal, facing impossibly powerful opponents in battles that usually end in defeat of the hero. Bureaucracies prevail more often than not, but Kobayashi intended to illustrate the importance of protest, no matter how hopeless. 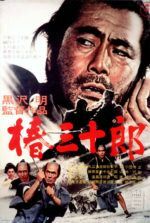 Adapted from Yasuhiko Takiguchi’s novel by screenwriter Shinobu Hashimoto, longtime collaborator with Akira Kurosawa on Rashomon, Seven Samurai, and many other landmark pictures, Harakiri marks the first of two collaborations between writer and director, the second being Kobayashi’s similarly themed Samurai Rebellion. Hashimoto wrote pictures that undermine authority in favor of a humanist argument; here he finds weaknesses in the dogmatic logic of feudal lords, the institution behind the film’s central conflict. But more decisively, he accuses samurai code, known as bushido, of humanist deficiencies, enough to describe the final product as an anti-samurai film. Kobayashi begins by detailing the crimes of a shameful state, the Iyi clan, one after another, and then slowly shifts his focus to expose holes in bushido that prevent characters from making just decisions. Harakiri opens on the Iyi clan’s emblematic samurai armor, which signifies the stability of the institution and the nobility of samurai honor. It appears engulfed by a fog, as if Kobayashi suggests its authority is somehow illusory or mythical. 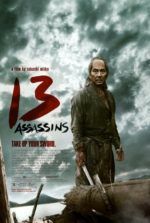 The clan’s journal reads that on May 13, 1630, no official business is worth noting, suggesting that the events to follow throughout the course of the film have been eased from Iyi records, foreshadowing that by the film’s end the clan remains in power. Furthermore, the date indicates that the Tokugawa shogunate’s feudal regime had just begun its reign over Japan, and as history proved, it would last another 250 years. Appearing at the Iyi temple gate, a down-and-out masterless samurai, known as a ronin, asks for an audience so that he might commit harakiri in their square. Bearded and weary-eyed, Hanshiro Tsugumo (Tatsuya Nakadai) lost his master some years earlier, and having failed to find employment under another master, he wishes to die honorably. During this time of peace for Japan, ronin were made to wander about seeking employment in another master’s army, or resort to criminality to survive. 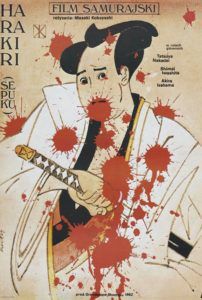 Harakiri, better known as seppuku, provides an honorable outlet to masterless samurai, serving as atonement for crimes or penance for disgrace, but it also illustrates samurai resolve and restores honor through the act of ritual suicide. In the most traditional performance, the samurai pulls a shortblade across their belly to disembowel themselves, and then a “second” behind them swiftly decapitates the subject. Lord Kageyu Saito (Rentaro Mikuni) listens to Tsugumo’s request and afterward offers a story about the similar case of Motome Chijiiwa (Akira Ishihama), another ronin who came to their gate asking to commit harakiri. Prior to Chijiiwa’s arrival, rumors spread throughout Edo of a ronin who arrived at a temple’s gates asking if he might end his life in the courtyard, but so impressed with the samurai’s resolve, the daimyo hired him instead. All over the land desperate ronin began appealing to their local clans, hoping to be hired on as retainers; meanwhile, none of them had any intention of committing harakiri, and often required a small payoff before they would leave. The Iyi clan realized Chijiiwa had the same dishonorable intentions, and to stop future ronin from pestering their temple, decided to make an example out of him. Kobayashi tells Saito’s story in flashback, showing the result in horrible detail. Saito proceeds to explain to Tsugumo how the clan discovered that Chijiiwa’s swords, said to be symbolic of a samurai’s soul, had been sold off and replaced by bamboo blades. They force Chijiiwa to carry on anyway, despite his pleas for a two-day respite, refusing to let him go out of their clan’s strict adherence to samurai honor. With no alternative, the fearful Chijiiwa thrusts the dull bamboo blades into his abdomen over and over to penetrate the skin; he then leans onto the blade to pierce deeper, releasing guttural sounds through his pain. In a final moment of agony, he bites off his own tongue to bleed to death and avoid any more torture under the sneering glares of the clan. Upon hearing Chijiiwa’s fate, Tsugumo assures Saito he has every intention of willingly committing harakiri, that his blades are indeed true and he will not falter. The Mifune to Kobayashi’s Kurosawa, Nakadai, an actor of deliberate movements and profoundly severe intention, mirrors the precise tone of the film in his grave performance. Kobayashi discovered Nakadai working as a store clerk in Tokyo in the early 1950s; noticing his deep voice and intense eyes, the director cast him in The Thick-Walled Room, and through the 1980s this director-actor partnership lasted eleven collaborations in all. Having worked with directors ranging from Hideo Gosha, Kon Ichikawa, Kurosawa, Mikio Naruse, and Hiroshi Teshigahara, Nakadai achieved major celebrity in Japan, and westward, being surpassed in popularity by only one or two other actors, namely Toshiro Mifune and Takashi Shimura. Known for his piercing onscreen presence, in Harakiri he puts forth his greatest performance, when his character reveals his true intentions. In the temple’s square, Tsugumo requests a top swordsman, Hikokuro Omodaka (Tetsuro Tanba), as his second. While a runner checks if Omodaka, or two other top swordsman, who have all been ill for days, can perform these duties, Tsugumo relates his sad story to the attendees and insolently suggests, “What befalls others today, may be your own fate tomorrow.” Tsugumo then declares that he served as adopted father to Chijiiwa, who bore a son with his daughter. When poverty sent Chijiiwa’s wife and son into illness, he sold his sword and hoped he could earn himself some pittance from the Iyi clan. Humiliated and forced into performing torturous suicide in the name of samurai honor, Chijiiwa never returned, and so his wife and child died. When Saito hears this, he insists that Tsugumo picks another second, but the rugged samurai refuses and admits he has no intention of executing harakiri. Tsugumo does not expect an apology, simply an acknowledgment from Saito that the Iyi clan went too far in making an example out of Chijiiwa. When Saito refuses, Tsugumo accuses the clan’s samurai honor of being false, exposing how the three top swordsman, the ones claiming illness, are actually hiding from embarrassment. In the preceding days, Tsugumo engaged each in duels and removed their topknots, the hair grown and folded forward on top of the head to symbolize samurai status. Tsugumo tosses the topknots before him, laughing with contemptuous scorn. Enraged, Saito orders his retainers to attack Tsugumo, who defends himself against dozens of men, killing many, but finally losing his life to a squad of riflemen. Japanese audiences know the feudal daimyo structure eventually crumbles in 1868, when the Tokugawa shogunate falls with the Meiji Restoration. Kobayashi demonstrates how even a lone individual bent on revolt can threaten the delicate arrangement of repressive authority, as Tsugumo tears down the Iyi clan armor in his final moments, before the clan resorts to dishonorably gunning down their skilled swordsman opponent. However quickly power is restored after Tsugumo’s death, that a single ronin usurped the clan and dismantled their emblematic armor is important, even if the act itself disappears when the victors write their history books and claim all casualties were lost to illness. “An incident of significance has taken place, while remaining unrecorded in official history, as though all were calm and nothing had ever happened,” Kobayashi noted. “That is the deceit of history.” In the final scenes, the Iyi clan’s restored samurai armor now exhibits a marker of continued hypocrisy through the ages in all systems of authority, but most notably samurai nobility. When Harakiri premiered on September 16, 1962, Japanese audiences saw the familiar cinematic landscape of feudal Japan portrayed in expressive, allegorical terms. Later described as Shakespearean by Kobayashi’s admirers, the film communicates its themes in graceful cinematic rhetoric, visually conveying intolerable class regimentation through calculated movements of the frame and theatrical lighting. A limited number of sets, used repeatedly to create a sense of space and sameness to reflect patterns of ritualistic behavior, might become claustrophobic to another filmmaker. Kobayashi’s frequent cinematographer Yoshio Miyajima utilizes fluid tracking shots interspersed with contrasted diagonals throughout to make the position, movement, and subtle contorting of the frame become an essential and telling narrative tool. After winning the Special Jury Prize at Cannes in 1963, both Harakiri and Kobayashi earned international renown. But as Kobayashi’s output continued to be critical of the establishment, his celebrity and the frequency of his employment waned. Studios wanted to avoid uncertain ventures, certainly ones that might antagonize the United States occupation army; after all, his reputation was that of a critical filmmaker who takes risks, not one who makes surefire box-office successes. And so Kobayashi, along with Akira Kurosawa, Keisuke Kinoshita, and Kon Ichikawa, dropped from the studio system and formed the independent film company Yonki-no-Kai, the Club of the Four Knights, whose productions began with Kurosawa’s Dodes’ka-den in 1970. Their company launched under a commercial failure, with many more underwhelming features to follow. And though Kurosawa would go on to reinvent his work with Kagemusha and Ran, Kobayashi left his best and most controversial films behind him. Subverting authority on the basis of human moral decency, Harakiri endures as Kobayashi’s most powerful film, and an uncommonly singular statement against samurai honor. Given the ingrained presence of samurai in Japanese cinema, and the samurai’s influence over Japanese principles from their feudal period to present, Kobayashi’s filmic assault transcends history to find modern parallels in their social infrastructure. Under his direction, Japanese warriors revered for centuries as symbols of military composure and nobility become hardened figures of corruption and emotional indifference, further outlining how systems of authority concern themselves only with the collective’s need in prioritized ranks, and rarely ever consider the individual. Dower, John W. Embracing Defeat: Japan in the Wake of World War II. New York: Norton & Company, 1999. McDonald, Keiko I. Reading a Japanese Film: Cinema in Context. Honolulu: University of Hawaii Press; annotated edition, 2006. Richie, Donald; Schrader, Paul. A Hundred Years of Japanese Film: A Concise History, with a Selective Guide to DVDs and Video. Tokyo; New York: Kodansha International: Distributed in the U.S. by Kodansha America, 2005.